Another elongated blister is located outside of the wheel wells and behind the wing’s main spar. I’m not sure about its purpose. Additional information from the readers would be appreciated! I’m not 100% sure, but the Mk XIX had extra wing fuel tanks in addition to the leading edge tanks, and there is evidence for tanks being installed in the gun bay area ( T VIII & T IX, also an unarmed PR version of the Mk IX schemed for Egypt ). 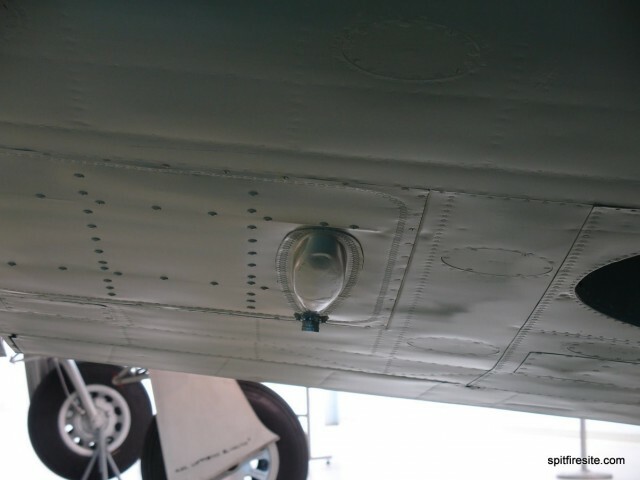 So my guess would be that the XIX tanks were fitted in the bays which housed the wing cameras in the PR XI, and the blisters are connected with the fuel system. Certainly there appears to be a vent pipe at the rear of the blister. You are correct about the wing tank. The skin on the under surface of the wing is the wing tank bottom and the blister is the sump. It is detailed on drawing 39065 Shts 13 & 14.